You are here: Home > Blog > Energy, sustainability & economics > Log fires and stoves – do we have to use hardwoods? they take much less time to season (dry out), typically 6 months rather than the two years needed for hardwoods. Whilst softwoods are lighter, their calorific value (how much heat they give off) is generally the same as that of hardwoods on a weight for weight basis. 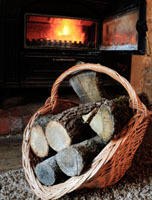 All current log-fuel burning equipment works well with either hardwood or softwood logs, or a mixture. This is good news for many owners of small woodlands because very often for management reasons you will want to take out softwoods planted in the 1960s and 1970s or simply thin them out. It is often hard to find a good market for such timber (especially lodgepole pine and spruce) so being able to use it for firewood can be a great help. Prices of all firewood have been rising over the last couple of years and, because it is a retails market, it is less susceptible to swings in prices. Of course if you are using firewood form your own woodland you are immune to changes in market prices. Demand for firewood is currently growing rapidly, illustrated by the fact that domestic demand for wood-burning stoves in 2009 is said to be 50% above the level of 2008. We sell Stoves for a living and we also have a Rapeseed Oil business. We make Briquettes from the waste which work extremely well for wood burning stoves. Seasoned is considered under 25% kiln dried is usually under 20% but be sure and check with a moisture meter as not all of them are. below 15% your burning becomes a pollutant normal household stoves can’t cope with the gasses and they go up the chimney. We have 2 excellent Clearview woodburners in our rambling Victorian former rectory which greatly reduce our oil bill. At least one has been in use daily and often for 12 hours or more for the past 7 months. We mainly use a mix of hardwoods ( ash, birch and oak ) from our own wood but also blackthorn and hawthorn from thinning out field hedges. All burn well and we season these for at least 8 months including the ash which in our experience does not burn well green contrary to folklore. We also burn larch, Sitka and Norway spruce, generally seasoning these, particularly the larch for at least 2 years. Well seasoned dry larch is first rate although it tends to spit which can be an issue when opening the stove door for refueling. Sitka seems to season and dry out much quicker . All the softwoods make excellent kindling when really dry and are easy to split . It is essential to have plenty of covered well ventilated storage . We have stainless steel double skin flue liners and have these swept annually but despite constant use very little soot is produced. The amount of ash produced is also remarkably small given the volume of wood we burn and is spread around fruit trees and shrubs such as blackcurrant. I’ve never seen a moisture reading higher than 40 and seasoned wood should be less than 20. A moisture meter and a stove thermometer are invaluable to having an efficient fire. ‘cubic metre’ because it is difficult to compare weight due to the great variation in their moisture content, which in turn has a significant effect on heat output. Like some of the other comments I endorse the use of seasoned POPLAR in wood burners having culled 14 mature poplars and enjoyed free and very hot fuel for 4 years. The following relates only to use of logs in wood burning stoves; softwoods (pine etc), poplar/willow will burn if seasoned with good airflow but under cover for one year. It is best to at least cut/split into billets if you don’t have time/equipment to do the full log size & split that you will need for your stove opening. If left as round logs with bark on, the seasoning time will need to be extended by around 6+ months. Poplar/willow need plenty of airflow thru stove as otherwise they tend to just smoulder and smoke up the glass; pine doesn’t need so much air flow once alight, but on opening stove door beware of sparks flying as it re-ignites. If you can get it, always go for hardwoods. No matter what you burn on a wood burning stove, you will still be at risk of tarring toward the top of the flue if no rain-guard is fitted. It’s less of a long term problem if you have a steel liner, but with any other form of flue – beware tar if no rain-guard. My experience comes from being a small-woodland contractor and have been burning logs on wood burners for over 35 years. My wood is mainly Poplar. I have 2 wood burners at home and was dissapointed to hear that poplar would be a poor wood to use on it. Having read Paul’s comments I may just fell one of the trees this weekend and leave it to season. Does anyone know how long polar should be seasoned for? a tree worth thinking about if you have the space, and especially if you need some added wind shelter too.